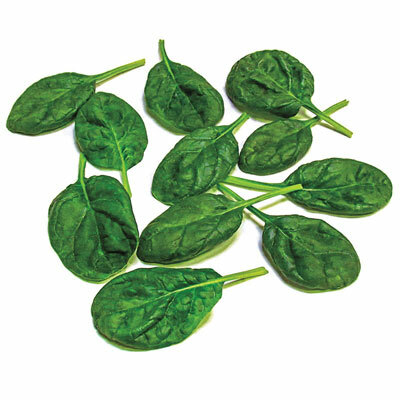 Olympia Hybrid Spinach | Henry Field's Seed & Nursery Co.
Due to its high bolt resistance and resistance to nine different strains of Downy Mildew, Olympia is a good choice for the South, where humidity often makes Downy Mildew a serious problem. Its semi-upright habit makes it ideal as either a baby leaf (cut just 3 weeks from sowing seed), or as mature spinach at 45-50 days from seed to harvest. 45-50 DAYS. Seed Counts: 1,200 seeds sows a 100-ft. row. For each offer ordered, get approx. 100 seeds per packet . Foliage: Thick and dark green leaves that grow upright. Pruning: Ideal as either a baby leaf (cut just 3 weeks from sowing seed), or as mature spinach at 45-50 days from seed to harvest. Fruit: Deep dark green, smooth leaves.